Today is G-Day in the A to Z Challenge. So how about some grammar? I admit it. I love grammar. Ever since the third or fourth grade when we had to do those error hunts in our English book, I have loved grammar. Of course, those error hunts are considered so out-of-date now. Even so, some schools persist in this textbook approach. My daughter knows of my love for grammar and when the grandkids get stuck on their traditional grammar assignments, she calls me to help work through the problems. She knows that Granny Jan knows the answer! I keep a look-out for good posts on grammar. Here are a few of the best I have read or viewed recently. 1. Metaphors. Catherine Johnson posts an excellent video of ancient Chinese poems set to music with exquisite background scenery. Scroll down to see the video. It’s 14 minutes long, but well worth watching. 2. Writing for the Web. “What Hemingway Can Teach You About Web Writing” by Robert Bruce. 2. “Change Tense to Highlight Weak Verbs” by Tim Kane. 3. Change -ly adverbs into active verbs. “Adverbly yours” by Julie Bird. 4. Use commas correctly. “The Comma from Which My Heart Hangs” by Benjamin Samuel. 1. Common errors and grammar Nazis. This 14-year-old blogger has something to say! By Amanda @quirkyblogger. 2. Grammar Goofs That Make You Look Silly . Visual by CopyBlogger and Blue Grass. 3. Common errors. Victoria Grefer’s pet grammar peeves. 1. Don’t do it like this. “G is for Grammar Lesson” poem posted by Scott Thorbury. Use this poem in your English class. 2. Watch the prepositions. “Grammar Student Wrestles Bear” by Sharon Doyle. Cats have their own grammar, too. 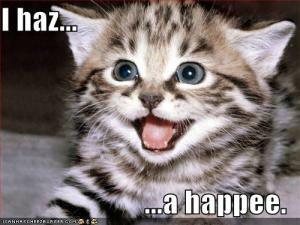 Here’s an example: I haz…a happee. Read about Official Cat Grammar Rules by Anil Dash. You, too, can be a copycat. 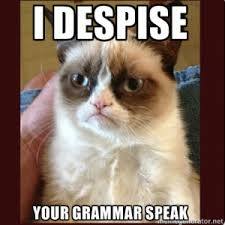 But, of course, Grumpy Cat (aka Tardar Sauce) has to have the last word. If it’s not his idea, he doesn’t like it.